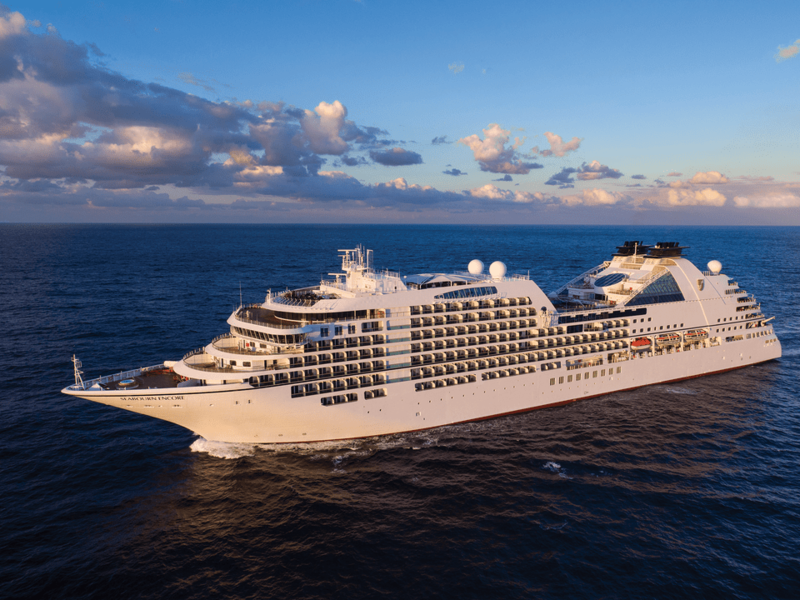 Seabourn Cruises launched the 600-passenger Seabourn Encore in December 2016, and the ship was christened in January 2017 in Singapore. Although the basic model of the Seabourn Encore is about the same as the brand's older ships, this newer ship is slightly larger, and hosts exciting new dining venues and onboard programs and activities. Cruise travelers new to Seabourn will appreciate the almost-all-inclusive fare. All alcoholic drinks (except some premium wines and spirits), soft drinks, beer, water, and specialty coffees and teas are included. None of the restaurants charge a fee. All of the accommodations have a refrigerator, which is stocked with your personal favorites, and 24-hour room service is included at no charge. About the only extras are the shore excursions, The Retreat relaxation area, and spa & wellness treatments. The company has a free shuttle in most ports of call, so those who like to explore on their own can practically pay for their entire vacation in advance. Like other Seabourn ships, the Seabourn Encore sails worldwide itineraries. And, since most of the voyages do not repeat, many travelers book back-to-back cruises. For example, in the ship's first two years of service, she visits dozens of ports of call in Southeast Asia, Australia, the South Pacific, Middle East, the Mediterranean, and Northern Europe. The Seabourn Encore cruise ship has five dining venues and 24-hour room service. Each evening during turndown service, guests receive a copy of the daily dinner menu at all the restaurants. None of the restaurants or dining venues on the ship have an extra surcharge. Three venues on the ship are familiar to past Seabourn cruisers: The Patio, The Colonnade, and The Restaurant. The Patio is the Seabourn Encore's outdoor dining venue next to the swimming pool and mid-ship on deck 9. The Patio is open for al fresco lunch with salads, sandwiches, burgers, and daily specials like tacos, gyros, oriental, or roasted chicken. At dinner, the appetizers are served buffet style with the main courses coming from the menu. Grilled items like steak, fish, and seafood are the most popular, and most dinners include a pasta option. The Colonnade is the Seabourn Encore's deck 9-aft restaurant and has buffet dining at breakfast and lunch. Seating is either indoors or outdoors, and the outdoor views and evening sunsets over the ​ship's wake are spectacular. Dinner usually features a different international theme each evening such as French, Italian, Australian, or Indian. Two nights each week are reservation-only and feature dishes designed by Seabourn's culinary partner Thomas Keller, the world-renowned American chef responsible for five famous restaurants ashore, including The French Laundry and Per Se. The Restaurant is the main dining venue on the Seabourn Encore. Located mid-ship on deck 4, this elegant venue features open seating and exceptional food and service. The Restaurant is open for breakfast and dinner, and dishes are selected from a menu. In addition, it is usually open for lunch on sea days. Seabourn introduced Thomas Keller-inspired menus and items to its cruise ships in 2016, so it wasn't unexpected that the famous chef has a dedicated restaurant on the Seabourn Encore: The Grill by Thomas Keller. The Grill is located on deck 8 aft and ​is open most evenings from 6:00 pm to 9:00 pm for dinner. There's a nice bar nearby to sip a cocktail while waiting for dinner. This venue is very popular, so guests need to make their reservations as soon as possible. Often the first night, last night, formal night, or very early or very late are the easiest times to score a reservation. Sushi is the second new dining venue on the Seabourn Encore. It's Seabourn's first dedicated-sushi restaurant and is an intimate venue located mid-ship on deck 8, with bar and table seating. Like the other venues, the Sushi menu is found in each day's schedule. It's fun to watch the master sushi chefs at work, and the selection of rolls, sashimi, nigiri, and small plates is innovative and beautifully presented. The lounges and bars on the Seabourn Encore are similar to those seen on the other Seabourn ships. The one new bar is inside The Grill by Thomas Keller on deck 8. The Observation Bar on deck 11 is a favorite of many cruisers since it has the amazing views of the sea. Although it's a great place for a before or after dinner drink, the afternoon tea and snacks shouldn't be missed. All of the 300 accommodations on the Seabourn Encore are classified as suites, and the ship has six different types of suites available in several different categories. The categories are similar in size and location to those in the Odyssey-class of Seabourn ships like the Seabourn Sojourn suites, and the decor is contemporary and well-designed. The price of each accommodation category varies based on size and location. The 470 Veranda Suites are the smallest accommodations on the Seabourn Encore, but on most cruise ships they would be some of the most spacious and luxurious. These suites have about 300 square feet of inside space, plus an 85 square foot balcony. All the Veranda Suites have a small sitting area, queen-size bed or two twin beds, dining table for two, walk-in closet, interactive flat-screen television with music and movies, fully stocked bar and refrigerator, makeup vanity, and bathroom with separate tub and shower. The suites also have luxurious linens and premium bath amenities along with robes and slippers to use while on your cruise. The 14 Penthouse Suites on the Seabourn Encore have 436 square feet inside and 98 square feet outdoors on the veranda. These suites have all the amenities found in the Veranda Suites, but the sleeping area is separate from the living area, which allows more privacy. The dining table sits two to four guests, so in-suite entertaining is easier. The five Penthouse Spa Suites have glorious aft views from deck 11 and measure 536 to 539 square feet of inside space plus a veranda of 167 to 200 square feet. These suites have all the amenities of the Penthouse Suites, plus complimentary full-day access to The Spa at Seabourn serene area, a second refrigerator stocked with waters, juices, and healthy snacks, and additional spa products and amenities. The seven Owner's Suites measure 526-593 square feet inside and a veranda of 133-354 square feet. They have a separate bedroom and dining table that seats four. The suite also has special features like an espresso machine, fresh flowers, fruit basket, complimentary Wi-Fi, and a visit to the navigational bridge when the ship is in port. The two Signature Suites are forward on deck 8, so have the same views as the Captain and navigation team have from the bridge. These suites have 859 square feet of inside space, plus a huge veranda of 493 square feet, so these suites are perfect for those who love private outdoor spaces. Although the Signature Suites do not have a solarium, they do have all the other special features and perks found in the Wintergarden Suites and Owner's Suites. The two Wintergarden Suites mid-ship on deck 8 have the ship's largest inside space, measuring 914 square feet inside plus a 138 square foot outdoor veranda. Part of the veranda is a solarium with large soaking tub and daybed, which is perfect for napping. The large suite has a dining table for six, separate guest half-bath, pantry with wet bar, two flat-screen televisions, and complimentary Wi-Fi. Seabourn Square, which is aft on deck 8, is the hub of the Seabourn Encore cruise ship. Seabourn Square replaces the traditional reception desk found on most cruise lines. Instead of standing in line, those guests with questions, problems, or requests can meet with a concierge staff member in a private, sit-down setting. Seabourn Square also has a shore excursion desk, computer center, library, and living room-type seating area. Even with all of these features in the Seabourn Square, the most popular area is the coffee shop, which is open from early in the morning (about 6:15 a.m.) until 6 p.m. and then opens again from about 8 p.m. until 10 p.m. The coffee bar serves specialty coffees, light breakfast (pastries), sandwiches, and cookies, all of which are included in the basic fare. The Seabourn Encore has a large outdoor swimming pool on deck 9 and many comfortable lounges on the outdoor decks and surrounding the pool. Bar staff circulate ​the area and offer complimentary cold drinks all day, so guests don't even have to move from their chosen spots. The swimming pool is flanked by two whirlpools, and The Retreat also has a whirlpool. Those looking for a more intimate area might want to check out the small pool and two whirlpools on deck 5 aft behind The Club lounge. It's often never found by those who don't frequent The Club. Cruise travel can be one of the most active vacations or it can be one of the most relaxing, depending on what you want to do with your precious time off. Although the Seabourn Encore travels to many of the world's most amazing destinations, her guests can also choose to just relax by the pool, escape from it all in The Retreat, or visit the spa or fitness center to relieve some of the stress in their lives. Seabourn has partnered with Dr. Andrew Weil to provide a new Spa & Wellness program that will appeal to many cruise travelers. An onboard Wellness Guide who is a certified yoga and meditation practitioner leads sessions in Mindful Meditation and yoga along with holistic spa and wellness experiences that include physical, social, environmental and spiritual well-being.